A busy moment at Circourt Bridge, Denchworth, on 16 April 2015. 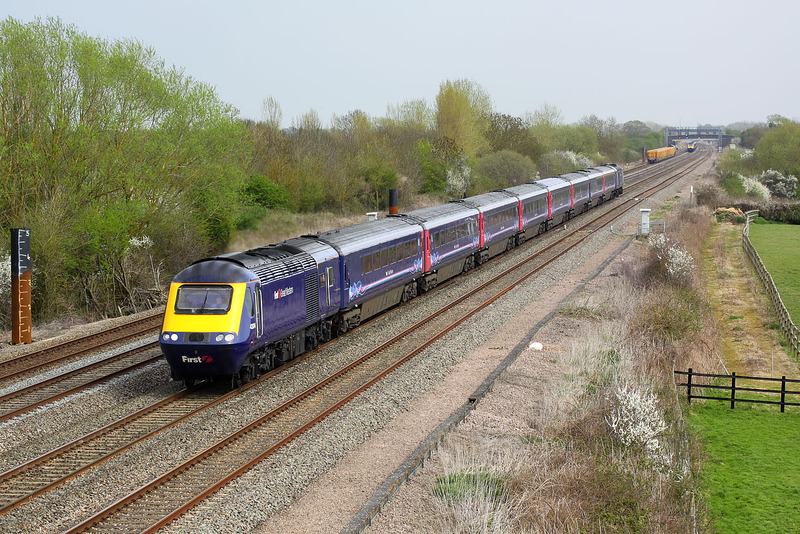 43004 First for the future / First ar gyfer y dyfodol heads west with the 1C14 12:30 Paddington to Bristol Temple Meads First Great Western service, while the balancing 1A17 12:30 Bristol Temple Meads to Paddington recedes into the distance. Stopped on the relief line is 66729 Derby County with the late running 6M40 11:56 Westbury to Stud Farm ballast empties. Note the red, green, and amber aspects on the signals by the bridge in the background.